Available in metallic finishes, the iPhone Lightning Dock perfectly matches your iPhone. 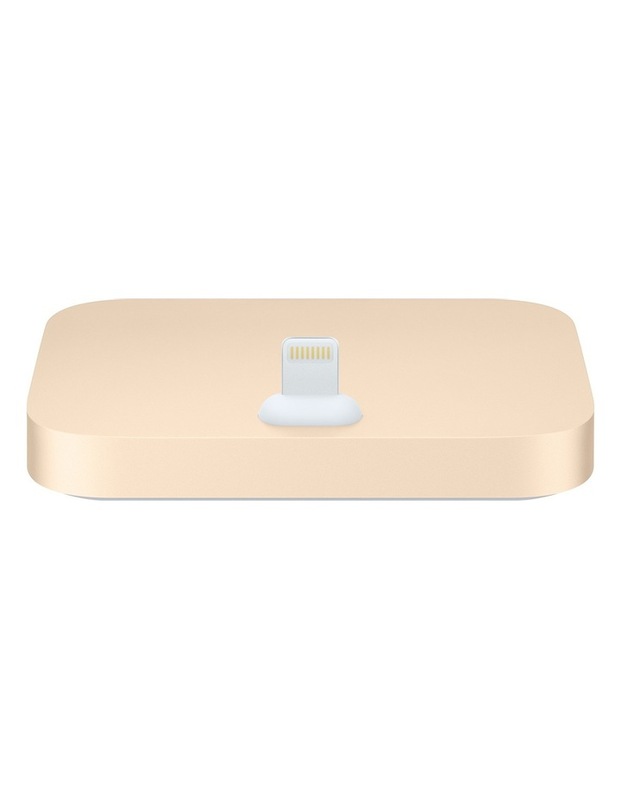 You can use it to charge and sync any iPhone that has a Lightning connector. Your iPhone sits upright in the dock as it syncs or charges, so its ideal for a desk or worktop. Even when your iPhone is in an Apple-designed case, its easy to dock. And you can unlock iPhone or use Touch ID without having to remove it from the dock. • Connect the dock to your computer with the USB cable (included with your iPhone) to sync iPhone and charge its battery. • Connect the dock to a power point using the Apple USB Power Adapter (included with your iPhone) to charge the battery. • Place your iPhone in the dock and enjoy clear audio during speakerphone calls. • Connect your headphones to the dock so you can listen to music. • Connect the dock to powered speakers or a stereo using a 3.5mm cable (sold separately) to play music and podcasts from your iPhone.